Western Kenya is a part of the world with high human and livestock population densities, representative more largely of the whole Lake Victoria Crescent ecosystem. This is a rural area (around 95% of households depend on agriculture as their primary source of livelihoods) where farmers are mixed crop-livestock small-holders – families generally grow crops and keep on average 2.5 head of cattle. The high densities of livestock and people, and the environment in which these populations live, makes it an ideal location to study the transmission of a group of multi-host pathogens that infect both animals and people: zoonoses. Approximately 60% of human infections are zoonotic; livestock are an important reservoir for many of these, including a number of so called “neglected zoonotic diseases”, a term coined by the World Health Organization (a seminal report on this matter is available from WHO) to identify a group of infections that receive little interest from policy makers, that are under-researched and largely poorly understood, but that none the less impact significantly on the livelihoods of a great number of people. To address this lack of knowledge, the Wellcome Trust, awarded a project to a team of epidemiologists from the University of Edinburgh (UK) who are working in partnership with ILRI and the Kenya Medical Research Institute (KEMRI). The aim of this project, termed the People, Animals and their Zoonoses (PAZ) project is to better understand the epidemiology and burden of several zoonotic infections of livestock origin in this area, and to understand the interactions between zoonotic and non-zoonotic organisms in terms of pre-disposing affected individuals to additional risk or burden. 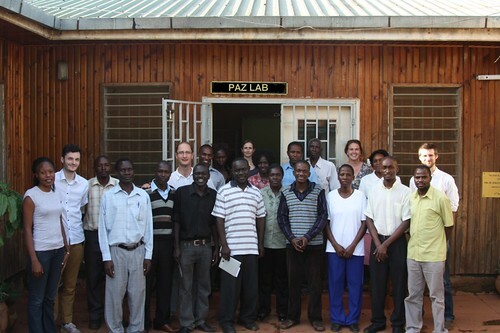 People, Animals and their Zoonoses (PAZ) field and laboratory teams, Busia, Kenya (photo credit: Eric Fevre). To achieve these aims, the team, led by Eric Fèvre, has established a joint human and animal diagnostic laboratory in the town of Busia. This lab, and the field teams working from it, operate using the principles of “One Health”, attempting to capture data and samples from livestock and humans together in a random sample of households in the study area. Further details of the project are available on the project website; ILRI have also produced an interesting 2 minute-long photo film for a visual overview : The connection between animal disease and human health. A clip from the Australian ABC “Catalyst” science programme also features the project (aired in March 2011). To understand not only the objectives, overviews, outcomes in the project, but also the lab and field procedures used, first hand experiences, challenges, and highlights of the project, several members of ILRI staff working on the PAZ project will be posting their experiences of “A Day in the Life of the PAZ Project” over the next few weeks. There are many aspects to this project – fieldwork involving collecting detailed data through questionnaires with household heads, individuals within households, slaughter house workers and so on. We ask detailed questions about socio-economics, behaviour, livestock keeping and health. We collect biological samples (blood and faecal samples) from humans, cattle and pigs, and these samples are transported to the laboratory by the field teams, who hand them over to the lab teams; in both the human and animal laboratories, samples are tested for several pathogens and analysed for several health indicators, before being deep frozen ready for transport to Nairobi, where a second level of diagnostic effort is applied at the ILRI campus. The project depends on attention to detail by all staff, and benefits tremendously from the enthusiasm that everyone involved shows for doing the best job they can. The PAZ field laboratory is based in the town of Busia, in Western Kenya, and is a collaborative centre involving the University of Edinburgh, ILRI, KEMRI and importantly, the Kenyan Department of Veterinary Services (DVS) with whom we have a close working relationship. 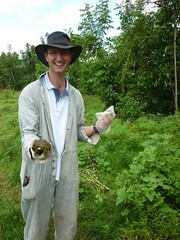 Eric Fèvre is the team leader of the PAZ project, and is a Wellcome Trust Research Fellow. He is an epidemiologist with a background in parasitology and biogeography, and with over a decade of experience working in the field with zoonotic infections at the livestock-human interface (Photo Credit: Charlie Pye-Smith).